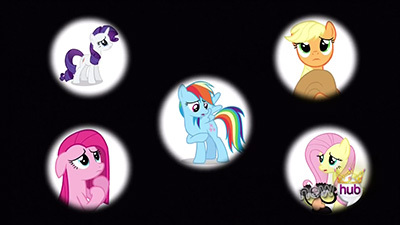 Twilight Sparkle wakes to find that not only have her friends’ Cutie Marks have been swapped, but their entire sense of self and destiny have also been altered as well. Worse still, they are completely and utterly incapable of fulfilling the destinies they think they’ve always own, which leads to the precipitous erosion of Ponyville and its surroundings. 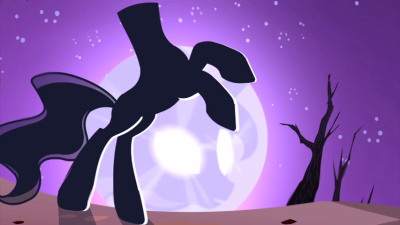 In what can only be considered My Little Pony: the Musical, Twilight rushes to put her dear friends’ destinies back on track… and unknowingly moves to fulfill her own destiny in the process. Twilight and friends have a monumental task from Princess Celestia – help reform a newly freed Discord and convince him to utilize his powers for good. Discord, however, has no intention of changing his ways, and only the threat of re-imprisonment by the Elements of Harmony are keeping him from running amok. With the others quickly running out of patience, Fluttershy thinks she might have the answer for bringing Discord around, but is she just being played for a fool by the lord of chaos? 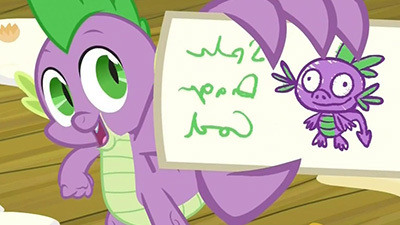 Upon being granted a surprise day off, Spike gleefully runs off to check off items on his list of activities he wants to accomplish during his free time. However, that list turns out to be woefully short and trivially completed; what else to do? 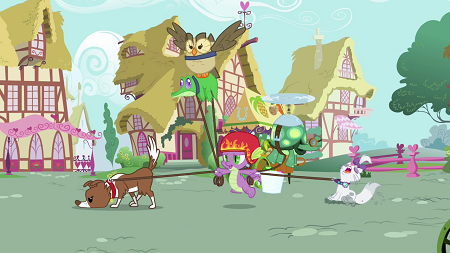 Naturally, this moment of boredom immediately cascades into a sequence of events that leads Spike trapped in the Everfree Forest and hunted by Timberwolves. 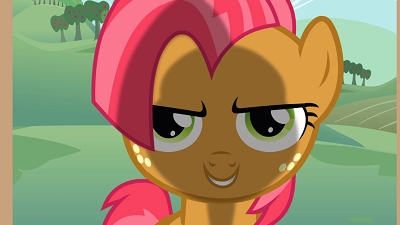 Applejack jumps in to save the day, and Spike pledges his life in service to the orange mare out of gratitude. 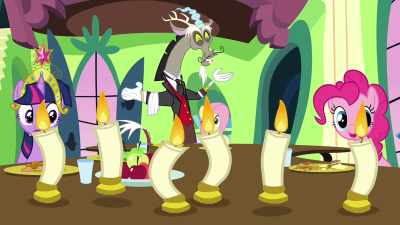 However, that “service” turns out to be anything but, and AJ tries her absolute darndest to free Spike of his “Spike the Dragon Code” and return to a life free of one catastrophe after another once again. 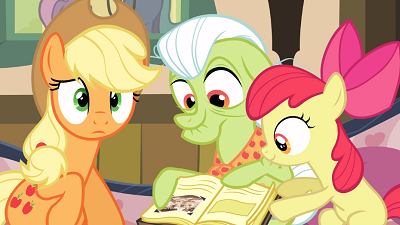 In which Applejack takes up the great responsibility of organizing the Apple Family Reunion, and learns that sometimes what you do isn’t as important as who you do it with. 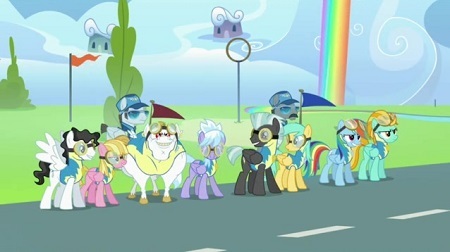 Rainbow Dash is accepted to Wonderbolts Academy and meets another version of herself. Speedy hijinks ensue, lessons are learned. The Great and Powerful Trixie has a personal vendetta against Twilight Sparkle, and she’s willing to go to great lengths to exact her retribution… even if that means allowing herself to be corrupted by a powerful magical artifact that drives her to seal all of Ponyville in a glass bubble and transform the village into her own personal kingdom. Or maybe she would have done that absent ancient magical influence anyway? In any case, Twilight must figure out a way to save the village from tyranny, but there’s just no way she can overcome Trixie’s impossibly powerful magic. 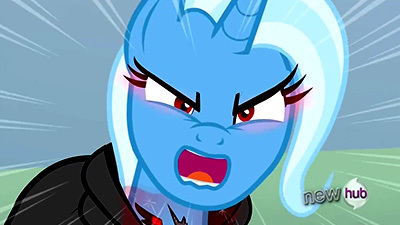 But what if there was a way to sidestep it completely and attack Trixie at her weak point for massive damage: her own vanity and blind pursuit of power? In which an Apple cousin from Manehattan comes out to the farm for a week, falls in with the wrong crowd, and becomes a worse bully than Diamond Tiara and Silver Spoon. No, really.